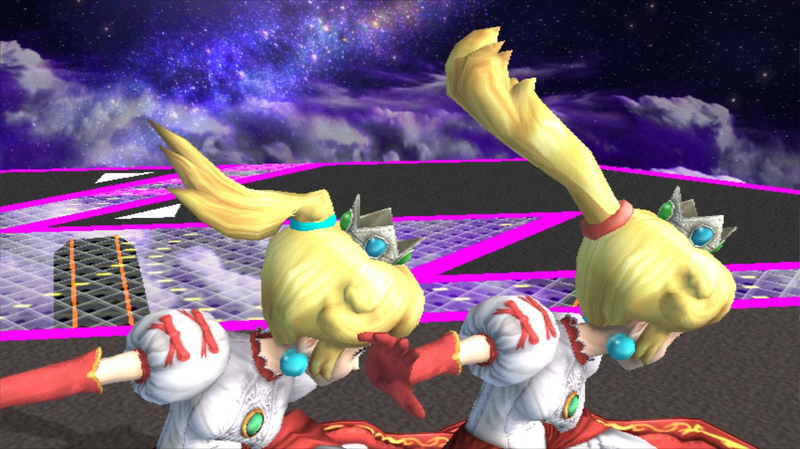 I never liked how the ponytail looked in Project M. It looked nothing like the ponytail Peach has in various games, and it was rigged horribly although that was because of limitations. 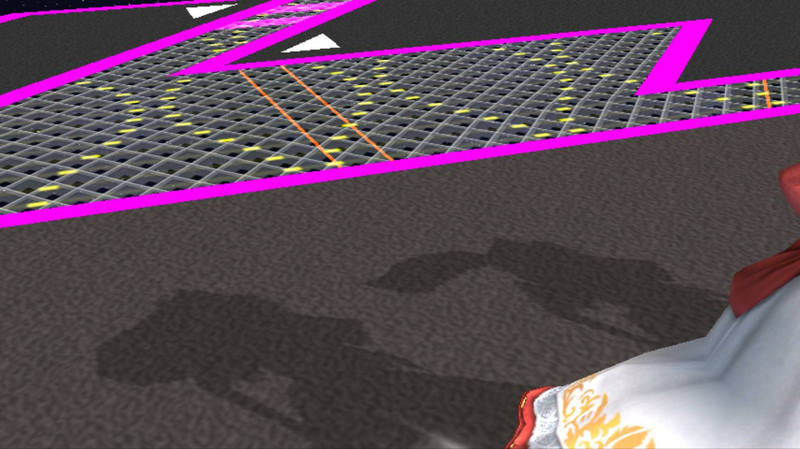 BrawlBox v0.76b introduced the ability to manually change bone indexes which controls the bones that hitboxes, hurtboxes and physics are attached to. So what I did was add an extra bone that moves the HairAN bone to fit the Ponytail better, then changed that bone's index to be at the end of the list. 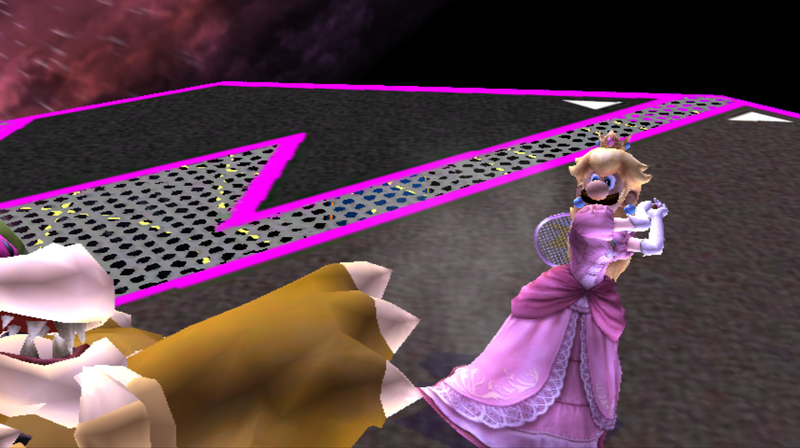 Since Peach does not have any hitboxes or hurtboxes attached to her hair bones, this should be wifi-safe. Replays work perfectly fine but otherwise I can't properly test this. I also gave her a red hairband to match the official version of the outfit. The back of her head was tweaked as well as the texture being edited to have better shadows. 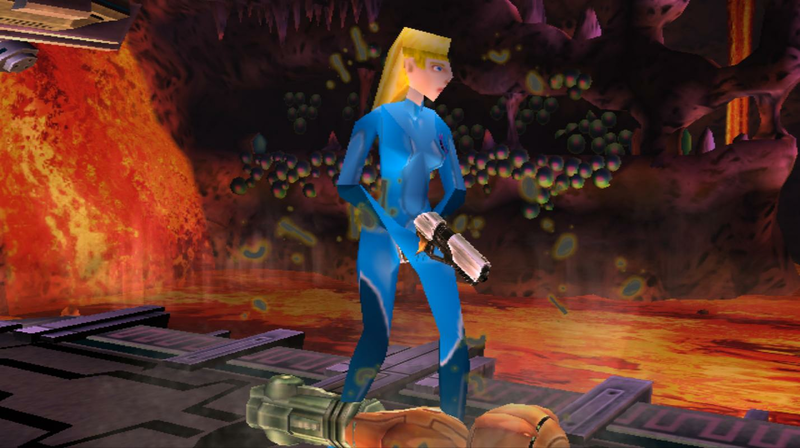 Speaking of shadows, the Shadow model has a ponytail now with edited bones for the hair physics. 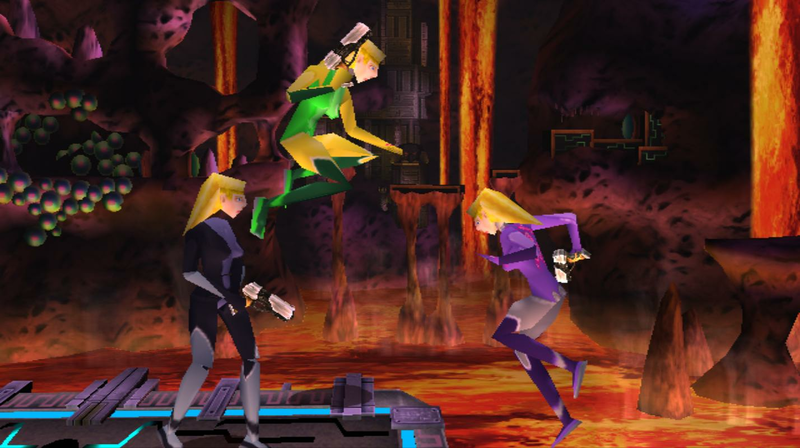 The ponytail model itself is from Mario Strikers Charged. 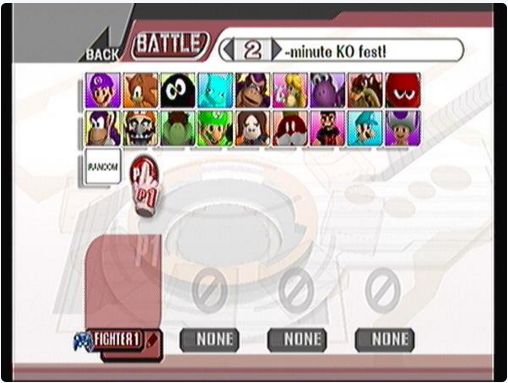 This is an unofficial fan edit and not a continuation of Project M.
This hack is not meant to be an angry response to Smash Ultimate, it is simply for laughs. Huge thanks to Marioking64DS for allowing me to use his Waluigi model for this, I did make a few touch ups like flipping the letter on his right glove, but the main model & textures were not by me. 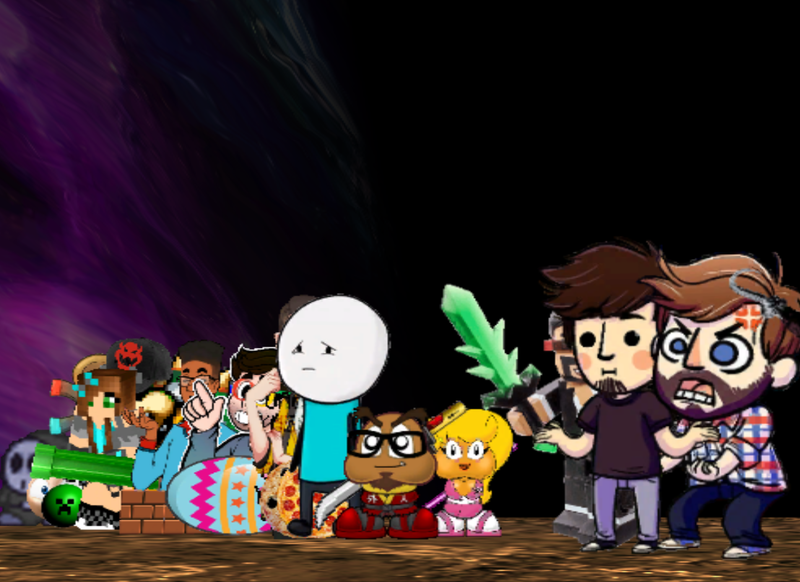 All edits to fit the Bosses' models were done by me as well as all the edits to the Bosses themselves. We've got edited skeletons to allow rigged mustaches & mouths for all bosses and edited animations to utilize them. New eye movement for most characters. Boss Icons are replaced & Names are changed. I've wanted to import this model for years now, and I finally found a download online. Rig is pretty good, although fingers aren't the best as I wanted to preserve the original shape as much as possible. Rigged Mouth, not bad considering the shape. This is only beta 2, so expect many more updates! Credit to: Muggy for re-texturing & StupidMarioFan1 for the original hack. After over a year I've finally remade the FNaF 1 characters in Brawl. Instead of (poorly) lowering the quality of Garry's Mod models to work in SSBB, I made the models from scratch along with most of the textures. 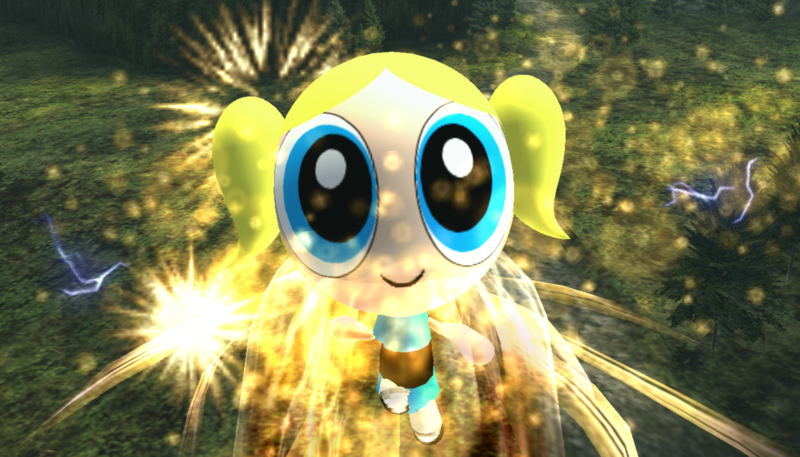 Some of the textures are edits of other people's textures like Everything Animations's body and eye textures. I resized & recolored them for each of the characters. These models were based off actual FNaF 1 images, both in game and promotional stuff. The 1 Year Anniversary pics were a great help regarding the more hidden things like the back of the Endoskeleton Head. I only looked at fan created stuff whenever I couldn't find a good angle of something, usually the Endoskeleton. These are simply model imports, no custom moves, it's all visual stuff. No custom sound effects either because the only way good way to do that would be to use the Text-To-Speech voices used in a lot SFM animations however I did not want to use those voices as they are not the official voices for the characters. Chica's Cupcake, Bonnie's Guitar, and Freddy's Microphone over a few weapons. Freddy has a handprint on his face. Foxy has an optional FitCaptainMotionEtc.pac that adds an Angry expression & Eye movement. Overall I am extremely satisfied with only my perfectionist side complaining about the tinest of details and am glad to finally be done with the FNaF 1 characters. Please read the Credits.txt for more details regarding what parts weren't made from scratch, as well as the other txt files before asking questions. \"It was fun being the puppet-master, but now I grow weary. It is time to put you in your place.\"
This is the only FNaF World character that I'm going to do and I only did this because I saw what Scott looked like in the game and knew I had to import him over DK. Model and texture were made by me and this took me less than 5 hours (the CSPs and Battle Portraits took up most of the time) because of how simple of an import this was. Is not effected by Stage Lighting to give a sort of \"glow\" effect. THIS IS ONLY FOR RIIVOLUTION! \"Oh you were expecting Link? TOO BAD! WALUIGI TIME!! 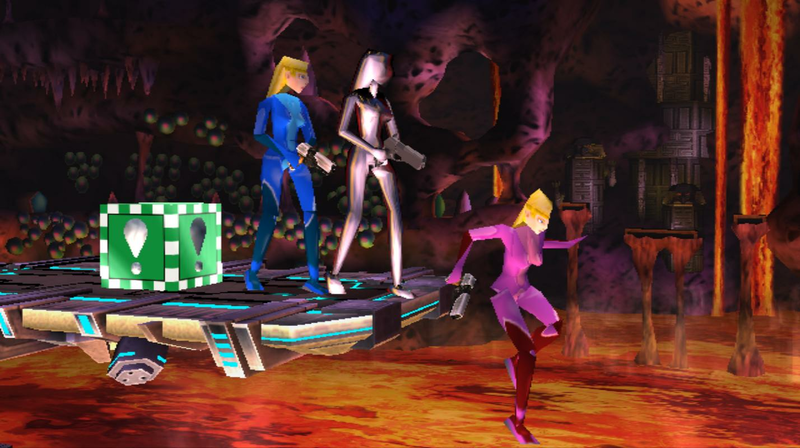 !\"
russmars2's awesome Waluigi hack for OoT has been transfered to Brawl! All versions have 2 sets of recolors, one set is based off Link's Tunic colors and the other is based off marioking64DS's Waluigi recolors. 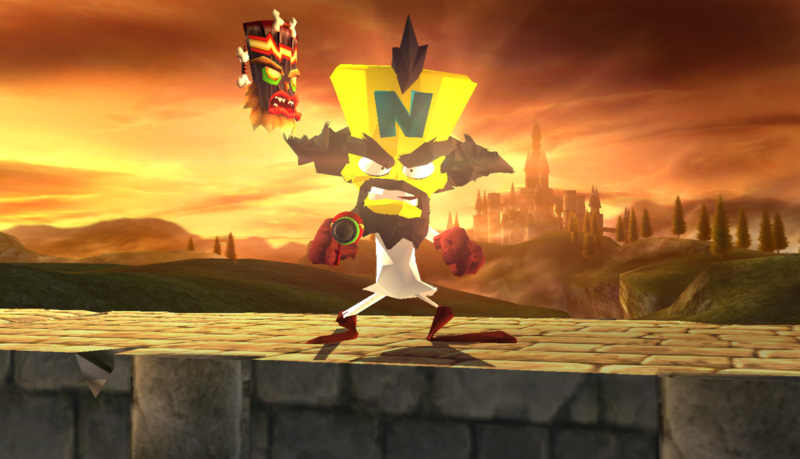 Glitched Colored Gauntlets based off both N64 OoT's & 3DS OoT's (different colors for both versions of the game), only applied to default Waluigi but you can swap the textures for recolors. 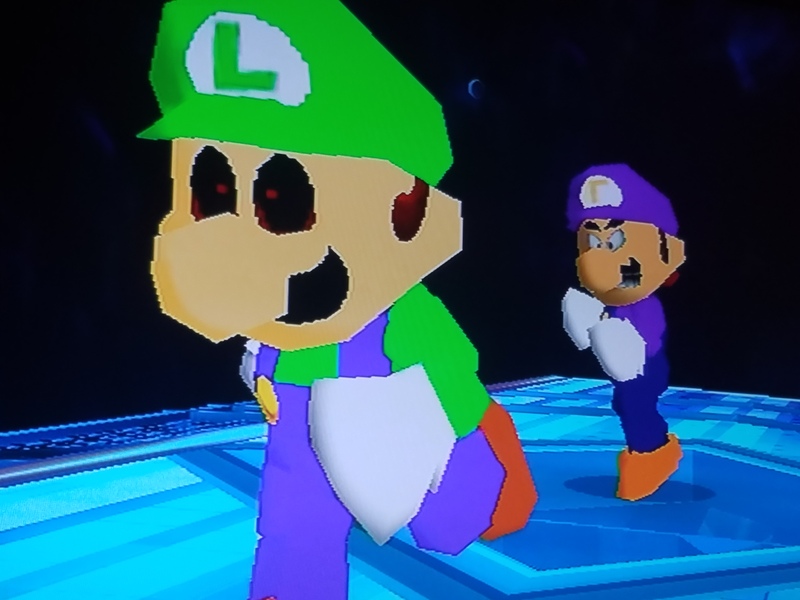 Dark Waluigi who has the same 12 variations. Character Select Portraits, Battle Portraits and Stock Icons for all versions. Stock Icons are just heads so only one set for Master Sword and one set for Biggoron Sword versions. I included Tormod's Biggoron Sword PSA files for ease of downloading, but collaborated him so he still got downloads for the amazing hack. Vonyco's amazing Orchestra Remix of Dark Bowser's Theme, perfectly looped for an epic match. 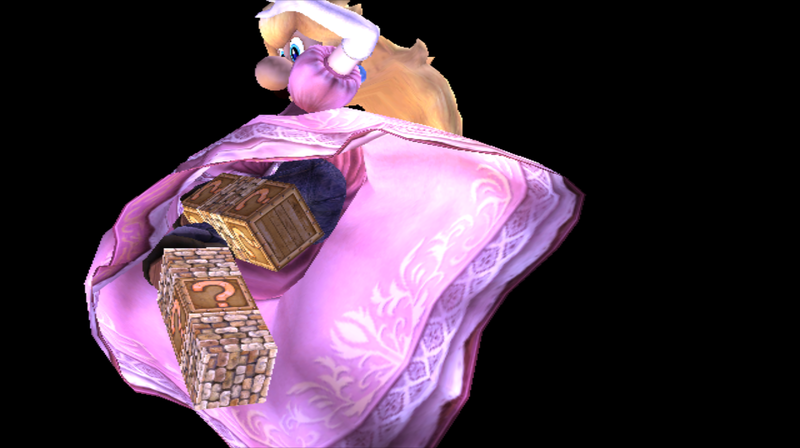 One-Slot Size Mod to be as big as the others, and a Wifi-Safe version where she is Peach's normal size. Golden Freddy, who's name would later become Fredbear, is here! "Uh... Interestingly enough, Freddy himself doesn't come off stage very often." FIXED: Melee Toad, apparently I didn't actually replace the original model & textures. 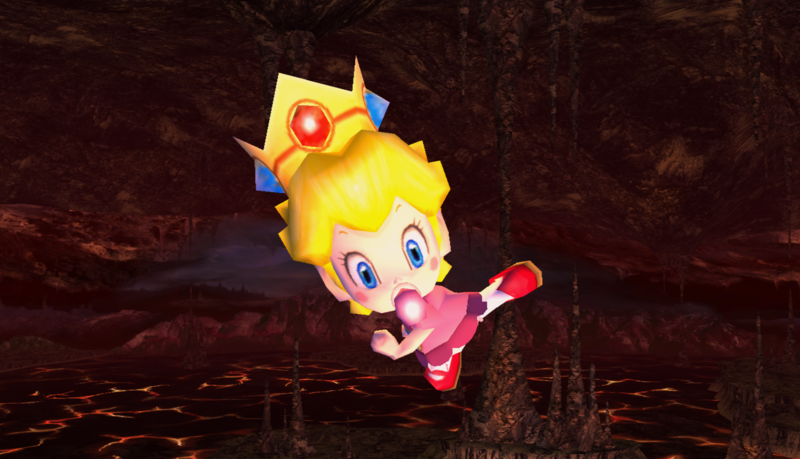 Peach from Smash Bros Melee has joined the Brawl. 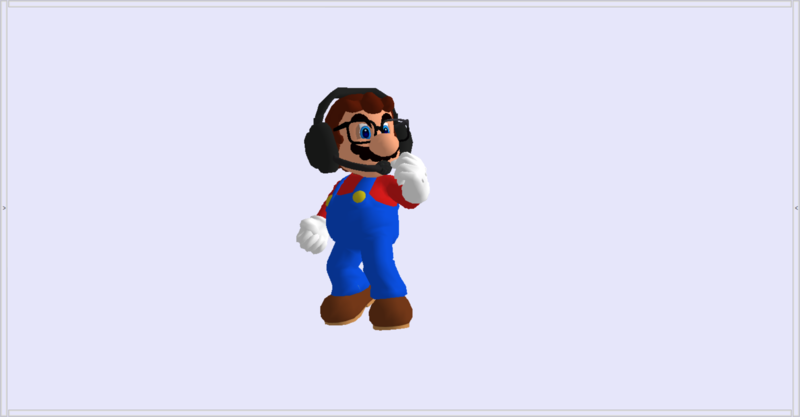 Based off the gmod model I made for smg4's FNaF3 video, I bring a Brawl-version of Withered Animatronic Mario! I used the same endoskeleton as I did for the original model. 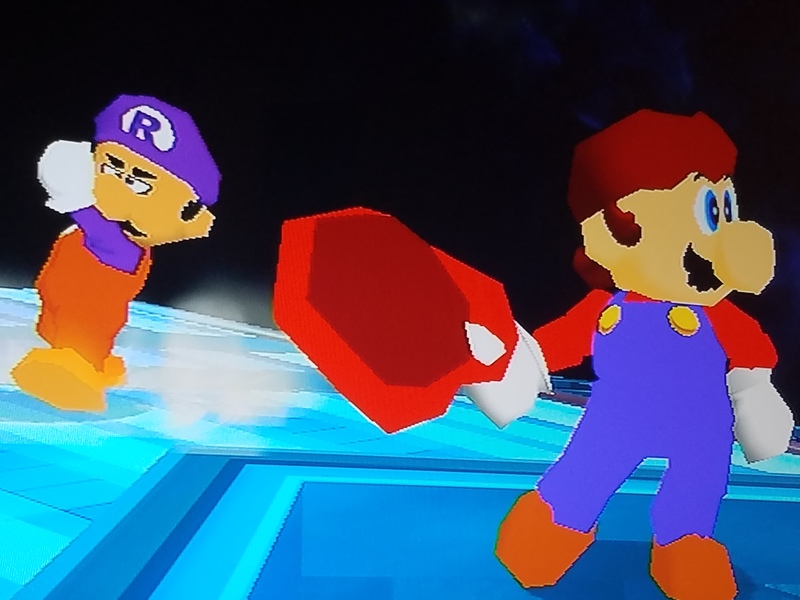 Mario from Super Smash Bros Wii U has downgraded to Brawl! Brawl had a perfect cover of K Rool's Theme...except for one thing: it included the beginning part in it's loop. Maybe it's just me, but I always hated how the song is in the middle of the upbeat drum segment and then it goes back to the calm-ish beginning segment again. For me it kills the mood, not sure if I wouldn't have minded it so much if the original theme did that (which it doesn't, the original stays in the badass drum segment), but either way, I decided to fix that. B05 is what the original song's name is in the ISO, but you can use this for any other song if you want, but I included the original's name so people knew what file to replace for the original one. 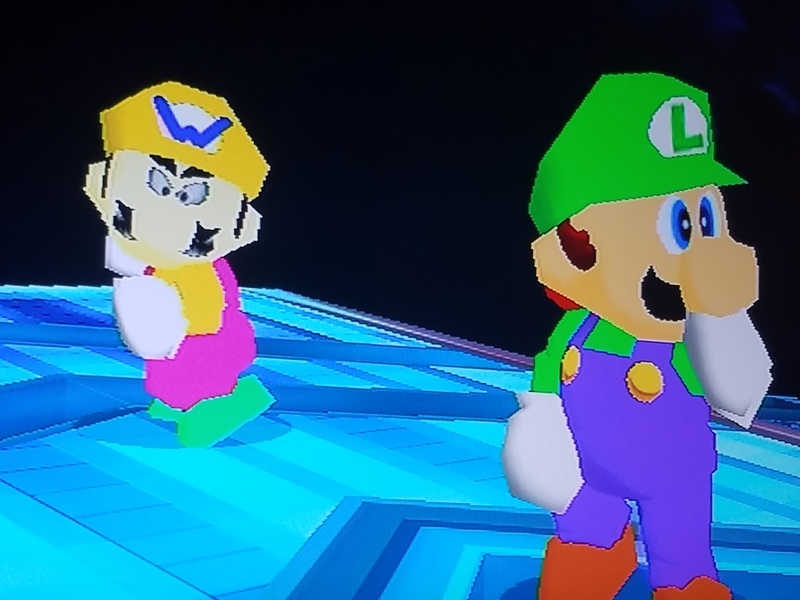 Luigi dressed up as Peach in Mario & Luigi: SuperStar Saga to fool Bowletta & Fawful into giving Mario the real Peach. This is more than a simple head replacement as I tried to make this more believable. 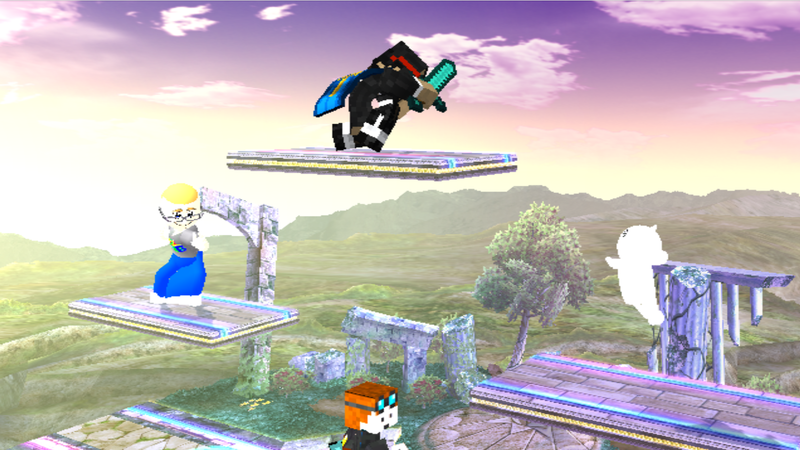 Has metals and final smash eyes, no recolors because I didn't feel like it was necessary. Page created in 0.304 seconds with 137 queries.